Glass-Guard is an invisible Liquid Applied Screen Protection with its universal design it can be applied to any screen. When we talk about being permanent we mean it. Scratch resistances is measured on the Mohs Scale of Mineral Hardness. Sapphires are known for there remarkable hardness at 9 on the Mohs Scale. This is the Third hardest mineral after the Diamond at 10 and Moissanite at 9.5. When Glass-Guard has bonded properly to your original screen it will make the glass as hard as a Sapphire. 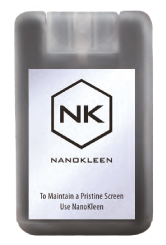 To Maintain a pristine screen use Nano Kleen! With the exponential growth in touch screen gadgets, namely Smart Watches, devices will get dirty with contaminants and finger prints.Smart Phones and Smart Tablets, inevitably the screen on these Nano Kleen is a uniquely formulated solution that has clever molecules that provide the ultimate clean screen. This solution contains no harmful chemicals or abrasives, leaving a streak free surface. 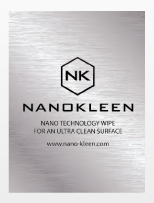 you can buy Nano Kleen in a 15ml pocket size spray bottle with a high grade microfibre cloth.